Your car isn’t working right, and the self-proclaimed car expert in your life says it’s something to do with the alternator. That’s less than awesome news . . . but what is the alternator, and what does it do? The alternator is designed around an electromagnet that rotates inside a set of coil windings to generate an electrical current. The electricity created flows through wiring to a device capable of storing energy. Simply stated, the alternator’s primary purpose is to recharge your car’s battery. The electrical energy the alternator generates also supplies power to your car’s accessories as you drive. In fact, it typically operates so efficiently that it can both charge your battery and operate your car’s electrical functions at the same time. The alternator has a pulley that spins the electromagnet inside. 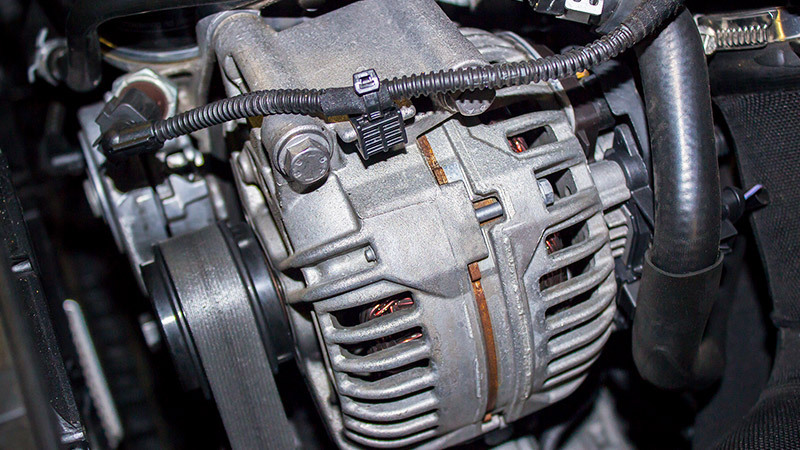 A serpentine belt or V-belt driven by the crankshaft is what drives the alternator. There are a couple cues that indicate you have a bad alternator. When you’re driving, the battery light comes on. You might notice initially that the battery light only comes on intermittently, which is a sign the alternator may be failing but hasn’t completely packed it in. There’s a whining noise under the bonnet. Yes, there are many parts that can cause a whining noise under the bonnet, but the alternator is a common one. Your headlights are dim or flickering. As the alternator can’t support the electrical demand anymore, lights become dim. Your engine won’t turn over. Eventually, a bad alternator means a dead battery, and your car won’t start. Unfortunately, there’s nothing you can do to predict or prevent an alternator problem. How Do I Know It’s Not a Battery Problem? It’s easy to confuse an alternator problem for a battery issue, especially since a bad alternator causes the battery light to come on. If you have a dead battery, it’s tough to isolate the concern. But if your car is running and the battery light comes on, it’s consistent with an alternator issue. Can I Drive with a Bad Alternator? Your car may run and drive even if the alternator is failing, but not for very long. Once the battery’s charge is depleted and the alternator isn’t recharging it, your engine will eventually stall out and your car won’t restart. How Long Should an Alternator Last? Some vehicles will never require an alternator replacement in their life. An alternator should be long-lasting component, and it’s unusual to replace an alternator in a vehicle with less than 100,000km. Being an electrical part, there’s always the possibility it could fail prematurely. How Much Does Alternator Replacement Cost? A new alternator for your vehicle won’t require a second mortgage, but it isn’t exactly inexpensive either. Depending on the car you drive, you can expect a repair bill of $400 to $900 or so, including both parts and labour. If you think you need an Alternator Replacement, use AutoGuru to get quick quotes from local mechanics.